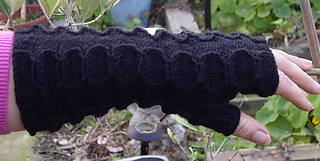 I don’t know about you, but my hands get cold when I am using the computer and I needed a quick pair of fingerless gloves to regain the feeling in my fingers. 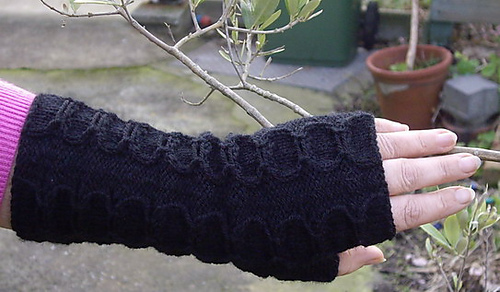 Knitted in the round with DK weight yarn in an unusual cable pattern, from Barbara Walker’s second treasury called the Dollar Cable, these gloves will keep you interested long enough that you won’t get bored, but knit up fast enough that you won’t stay cold either! Knitted on slightly smaller needles than normal to give a firm fabric.